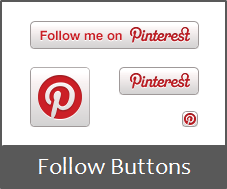 If you remember we have already discussed about adding Pinterest Pin It button. Now Pinterest offers official follow button for their users too. So you don't need to look out for Pinterest buttons images on the web or create likely buttons anymore. Pinterest official follow button allows Pinterest users to get followed by interested Pinterest users to stay in touch. It is yet easy to implement and has 4 different styles for you to select. The follow button directly links back to respective user's Pinterest profile. Also it's not a plugin that affects on your site performance or page load time. So do you wanna let other users to step into your Pinterest profile in a single click? Let's implement follow button on your site. You just need to add one below button code snippet onto your website. Select your favorite button code snippet and add onto your website where you would like it to appear. Add your Pinterest username here. In case if you don't know your Pinterest username, you can find it on Pinterest Settings page.